Pork Pie fuses the rich warmth of a 6.5x14 maple shell with the striking beauty of a Quartered Mahogany exterior. Payments as low as $26/mo. Pork Pie snares have long been regarded for the looks and sound. This Pork Pie 6.5x14 maple snare drum with a Quartered Mahogany veneer continues the tradition. It all starts with a thin 8-ply maple shell without reinforcing rings. The bearing edges are as smooth as they can possibly be and are blessed with a 45-degree cut with a small sharp counter-cut to focus the drum and raise the level of sensitivity. This thin maple shell snare sounds great as a ballad snare tuned down, but equally, the sharp bearing edges and solid construction means there’s no fear in cranking it right up for power and snap. For those who love the high tuning ranges, this 14" snare will be sure to please. For drummers, studios, and/or producers looking to add a new sound to their arsenal, any Pork Pie snare drum would be well worth a look. 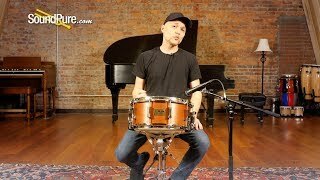 In this video, Sound Pure drums specialist Barry Knain demos and reviews a new, all American made 6.5x14 Maple Snare Drum-Quartered Mahogany Veneer from Pork Pie Percussion. Pork Pie drums are the top-of-the-line. Standard equipment includes: 100% maple shells, Pork Rings mounting system, 2.3mm hoops, heavy duty spurs and our hour-glass shaped lug. Finish choices are limitless.